Time magazine named the Moss Side-born Suffragette leader as one of the 100 Most Important People of the 20th century. We will be walking in her Manchester footsteps. Here’s why. In August 1819 at least a dozen people were killed demonstrating for the right to vote at St Peter’s Fields, Manchester. Nearly a hundred years later, in 1903, the Pankhurst family, disgusted with the Independent Labour Party’s refusal to allow women to use the newly-opened Pankhurst Hall in north Manchester, founded the Women’s Social and Political Union to step up the campaign for the right of women to have the vote in parliamentary elections. What had been a sedate pressure group, willing to stay within the law to change the law, soon became militant. 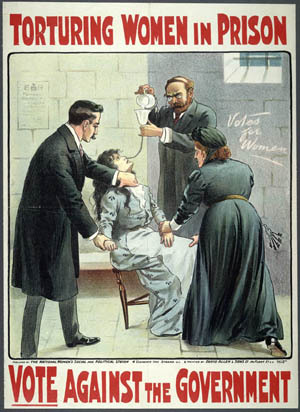 The women suffrage supporters (“suffragettes,” the Daily Mail called them, to mock them; it backfired) disrupted a Liberal Party rally in the Free Trade Hall in 1905 and two of their leaders – Christabel Pankhurst and Annie Kenney – were jailed. Manchester had become Suffragette City, but it took a generation and many thousands of broken windows for women to secure the vote. When Christabel Pankhurst and Annie Kenney were arrested for disrupting the Liberal Party’s political rally at the Free Trade Hall in October 1905 they were taken first to a cell in Manchester Town Hall and then to Strangeways Prison.